The ROC vs. the PRC: Obviously, the ROC is not “Taiwan,” and the PRC is not just the mainland portion of China. The major difference is the de jure status of Mongolia. Many “Sinologists” (China experts) commit a universal and unforgivable blunder. They erroneously use the term “Republic of China” as if it referred only to the offshore Chinese island of Taiwan, and the term “China” as if it referred only to the mainland portion of China. Ordinary Americans can be forgiven for dismissing these distinctions as unworthy of their attention, but “China experts” should know better. These constitutional law distinctions lie at the very heart of the cross-straits conflict, and could spell the difference between continued peace and nuclear catastrophe. These legal distinctions are not subject to “interpretation.” They are explicit provisions of the Republic of China Constitution. Taiwan independence leaders know this better than anyone else. They know it, and they hate it. They might try to deceive Americans about Taiwan’s current status. They might repeat the catechism, “Taiwan is already independent!” But in their heart of hearts they know that until and unless they author an new constitution and declare formal independence, Taiwan will remain an integral part of China. The Name Game: From ROC to ROT? 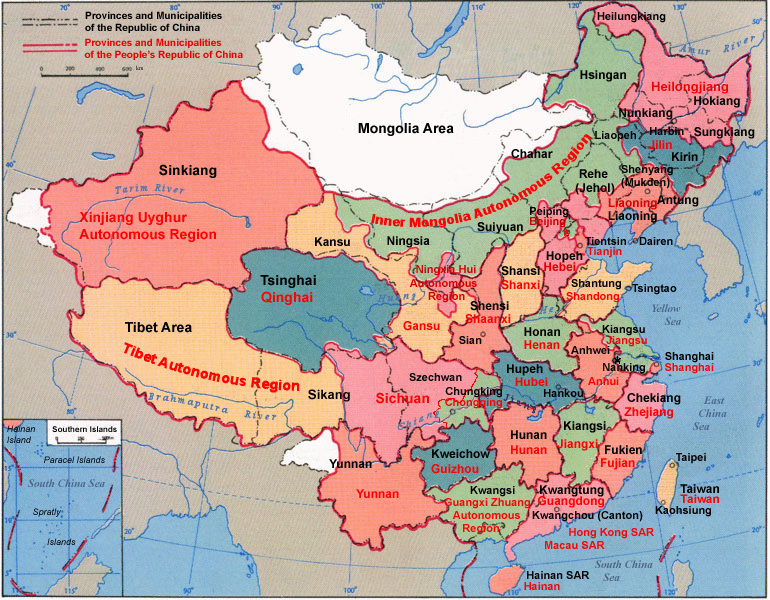 Black dotted lines are political boundaries drawn by the ROC. The formal names of these political entities are in black text. Red solid lines are political boundaries drawn by the PRC. The formal names of these political entities are in red text. White areas represent the territories claimed by the ROC but not the PRC. Source: Wikipedia, translated into English by Pryaltonian from the Chinese Wikipedia. I sometimes post something first, then when I have more time, add comments to it. Your observation was correct. My point was that the DPP’s “Resolution on Taiwan’s Future” alleges that “Taiwan is a sovereign and independent country. Its current name is the Republic of China.” The DPP’s resolution, is of course nonsense. Taiwan is not a country. It is a province of China. The DPP knows this. That’s why they still want a formal declaration of independence. If Taiwan really were already independent, why would they still be demanding a formal declaration of independence? They are kidding themselves. The DPP is led by a confused bloke. That’s why the party has a whole lot of confusing agenda.Watch Li Ao’s talk show and you’d be stumped by Ah Bian’s ignorance and dishonesty.Surely, Taiwanese didn’t vote DPP for independence. Thank goodness it stopped at Outer Mongolia, and USSR left Inner Mongolia, Manchuria, Xinjiang, and Tibet alone to China.Respect for ROC on the issue of Outer Mongolia. PRC pussied out, and even Mao was mad that China was powerless against Soviet pressure. I often allow comments such as the one above just to show the character of the Taiwan independence movement and its fellow travelers. As the old saying goes, "Give them enough rope and they'll hang themselves." I like to supply them with the rope. The Chinese view that any territory ever claimed or conquered by China at any point in history is Chinese for posterity is utterly preposterous and completely absurd. The general consensus in international relations is that the fall of an empire does not mean that the successor government gets to hang on to all of the empire's possessions. Such is the case with China and other empires throughout modern history. The ROC should immediately drop any and all territorial claims that the PRC has renounced on its neighbors. That way neighboring countries will not stir up trouble in territories that are clearly recognized to be part of the PRC. I see. I'll be sure to pass that on to the Beijing authorities the next time I'm there.